Well I’m nearing the end of my Dare to Get Dirty Challenges over at Splitcoast. This is another multiple challenge card. The card base is a standard A2 that’s been layered with some Prima card stock. The little strip down the right hand side is more from the same pad and has been dry embossed and layered over the same card stock. Same for the strip across but no embossing this time. The focal point image has been stamped in black and colored with markers. A little bit of white gel pen has been used for some highlighting. This oval was then sponged in the die. Next comes some die cut leaves that have been sponged also. And, finally, my ribbon roses. I have a large spool of plain white seam binding that I dye as I need it. 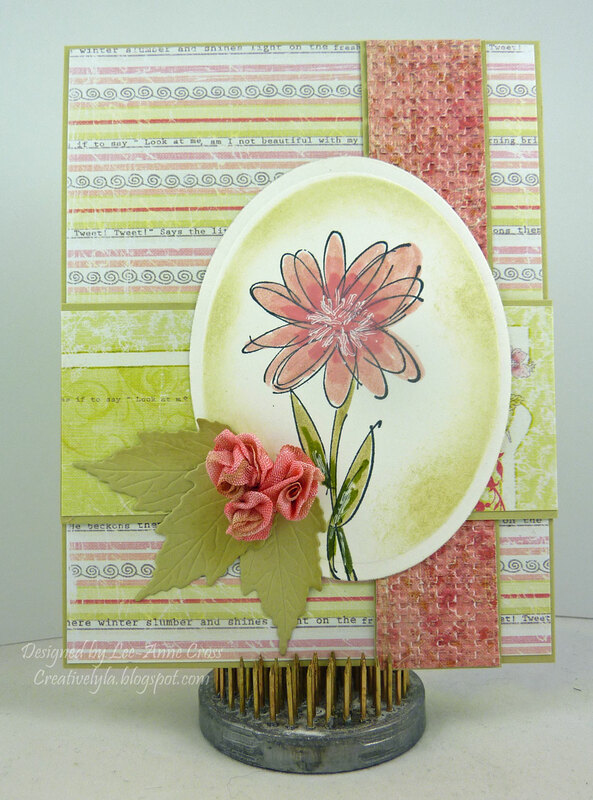 For this card, I used my Regal Rose stamp pad and then edged it with my River Rock marker. Next, it was spritzed with water, scrunched and then dried. Then I formed my ribbon roses and glued them on top of the leaves.